On the second anniversary of the October revolution Petrograd stands once more at the centre of the whole country’s strained attention. And once again just as two years ago, Petrograd has been threatened from the South-West, and just as happened then, at the end of October (old style) 1917, the fate of Petrograd has been decided on the Pulkovo Heights. In those days the military operations of the enemy and of ourselves alike were shrouded in an atmosphere of absolute uncertainty. Nobody could tell us, even roughly, what forces were attacking us. Some said that there were a thousand Cossacks, others that there were three, five or ten thousands of them, and so on. The bourgeois press and bourgeois rumour-mongering (at that time both of these were very loquacious) monstrously exaggerated Krasnov’s forces. I recall that I received the first reliable information concerning the number of Cossacks present from Comrade Voskov, who had observed their trains at Sestroretsk and categorically insisted that the Cossacks numbered no more than a thousand sabres. But it still remained possible that some more units might be on the march, since Comrade Voskov spoke only of entrained troops. Equally uncertain was the strength of the forces that we were in a position to counterpose to the Cossacks. We had at our disposition the quite numerous garrison of Petrograd. But this consisted of regiments which had lost their capacity to fight in the first upheavals of the revolution. The old discipline had been destroyed along with the old commanders. The revolution had demanded that the old commanding apparatus be smashed. There was as yet no new military discipline: Workers’ Red-Guard detachments were hastily formed. What striking power did they possess? Nobody could say, so far. We did not really know where to find the supplies we needed. The old military authorities were not at all in any hurry to make them available to us. The new authorities did not know how to get hold of them. All this created a situation of extreme uncertainty, in which it was easy for panicky rumours to arise and spread. At Smolny, I forget on what day, a garrison conference was held, with Comrade Lenin and me, at which the commanders were present. A section of the officers had already gone into hiding at that time, but a considerable number had remained with their regiments, not knowing what to do, and, from tradition, considering it impermissible to abandon their units. Not one of the officers who took part in that conference allowed himself even to hint at the inacceptability of ‘civil war’ and unwillingness to beat off Kerensky and Krasnov. The reason for this was, principally, the complete confusion that prevailed among the officers, who had, of course, no cause to cherish Kerensky’s regime, but who had no grounds, either, for rejoicing at the accession of the Soviet regime. There was as yet no organised camp of counter-revolution. The agents of the Entente had not yet spread their nets. In these circumstances, the simplest decision for the commanders to take was to stick with their regiments and do whatever these wanted. To which it must be added that the commanders were already subject to election, and the most hostile elements had been got rid of. However, none of the commanders wanted to assume responsibility for directing the whole operation, partly because, so far as I recall, none of the participants in the conference had had a great deal of military experience, but, principally, because none of them wanted to push himself forward too much, since they did not know what the outcome would be. After some unsuccessful attempts to induce certain regimental commanders to take charge, the choice fell on Colonel Muravyov, who subsequently played no small role in the military operations of Soviet Russia. Muravyov was a born adventurer. At that period he considered himself a Left SR (Left-SR-ism then served as a cover for many a sly fellow who wanted to get in with the Soviet regime but was unwilling to assume the heavy burden of Bolshevik discipline). Muravyov’s military past, apparently, was that of an instructor in tactics in a Junker training school. Though a Khlestakov [Khlesrakov is the ebullient confidence-trickster hero of Gogol’s play The Inspector-General (1836)] and a braggart, Muravyov was not without certain military talents: quick thinking, boldness, ability to approach soldiers and encourage them. In Kerensky’s time, Muravyov’s adventuristic qualities had made him an organiser of shock-troops, which were, as we know, directed not so much against the Germans as against the Bolsheviks. Now, when Krasnov drew near to Petrograd, Muravyov himself, and rather insistently, put forward his candidature for the post of commander of the Soviet forces. After some understandable hesitations, his application was accepted. A group of five soldiers and sailors, elected by the garrison conference, was attached to Muravyov with the responsibility of keeping him under continuous observation and, in the event of the slightest attempt at treachery, to put him out of harm’s way. Muravyov, however, did not intend to betray us. On the contrary, he got down to work with the greatest cheerfulness and self-confidence. Unlike other workers in the military sphere at that time, especially the Party members among them, he did not complain about shortages and defects, or about sabotage, but made up for all shortcomings with his cheerful eloquence, gradually infecting others with his faith in victory. The principal organisational work had to be performed, however, by the workers’ districts of the city. There they hunted out the necessary rifle ammunition, shells, guns, horses and harness and wheeled the improvised batteries into positions which they were fortifying at the same time. The regiments of the Petrograd garrison moved rather sluggishly into their positions. At that time, in the dawn of the October revolution, the mass of the workers were not yet aware of the necessity of stern struggle to consolidate the revolution. It seemed to the masses who had been conquered by the ideological power of the revolution that the question had been finally decided by means of agitation alone, by the power of words. The armed clashes with the Cossacks seemed to them to be a regrettable misunderstanding which accidentally interrupted the triumphal march of the October revolution. They did not take seriously the battles that lay ahead, preferring to send agitators and negotiators to meet the enemy. The outcome of the battle was decided by the artillery, which, on the Pulkovo Heights, did considerable damage to Krasnov’s cavalry. Casualties of 300-500 killed and wounded were mentioned – undoubtedly an exaggerated figure. The Cossacks fought without any particular zeal. They had been assured that the population of Petrograd would receive them as deliverers, and that a minor artillery bombardment would suffice to bring an end to their campaign. They halted, complained to their commanders, held meetings, and entered into negotiations with the representatives of the Red Guards ... Eventually, the Cossacks withdrew to Gatchina, where Krasnov’s head quarters was. Kerensky fled, deceiving Krasnov, who, seemingly, was preparing to deceive him. Kerensky’s adjutants, and Voytinsky [V.S. 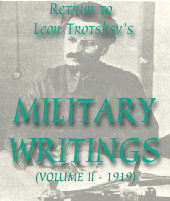 Voytinsky, a former Bolshevik, became Kerensky’s commissar for the Northern front in the World War, and took part in the attempt by Kerensky and Krasnov to suppress the Bolsheviks in November 1917. ], who was with them, were abandoned by him to their fate, and were taken prisoner by us along with Krasnov’s whole headquarters. The onslaught had been repulsed, the October revolution had been consolidated. At the same time an epoch of continuous and intense civil war had opened. Two years later we have had once more to safeguard the October revolution on those same Pulkovo Heights. Krasnov, who was imprudently released in 1917, is now fighting with Yudenich’s forces in front of that same Gatchina where we took him prisoner. Together with these features of similarity there is also, however, an immense difference: in those days Petrograd still swarmed with bourgeois and intellectual elements, groups, circles, parties, newspapers – and all that motley fraternity thought that the world belonged to them, that the Soviet power would prove to be a short-lived accident. The proletariat went into its revolution with great enthusiasm, great faith and élan, but also with a great deal of good humour. During these two years, the broom of the revolution has passed harshly over the bourgeoisie of Petrograd. On the other hand, the workers of Petrograd have undergone tremendous trials. Their enthusiasm does not burn with such an outwardly striking flame as was the case two years ago, but, as against that, they have acquired experience, firmness, confidence, spiritual tempering. The enemy has organised himself and become stronger. It is not a thousand Cossacks who are now attacking Petrograd, but many hundreds of thousands of soldiers, armed by the resources of world imperialism, who are attacking the Russia of October. Petrograd is threatened by tens of thousands of White soldiers who are very well armed. British ships are firing fifteen-inch shells at our coast. But we, too, have become stronger. The old regiments have gone. The improvised detachments of armed workers have also seen their day. Their place has been taken by a properly-organised Red Army which, it cannot be denied, has known its moments of depression, failure and even pusillanimity, but which has always been able, in the end, at the moment of danger, to focus the necessary energy and rebuff the enemy. Two years ago Petrograd came forward as the great instigator. Today, world imperialism wants to show, in Petrograd, its power to suppress the revolution. The struggle over Petrograd is assuming the character of a world-scale duel between the proletarian revolution and capitalist reaction. If this duel were to end badly for us, that is, if we were to give up Petrograd even temporarily, this severe blow would still not mean the downfall of the Soviet republic. Behind us there still lies an immense place d’armes where we can manoeuvre until ultimate victory. On the other hand, a victory for us in the Petrograd duel will mean a crushing blow for Anglo-French imperialism, which has wagered too highly on the Yudenich card. In fighting for Petrograd we are not only defending the cradle of the proletarian revolt but are also fighting in the most direct way for the extension of this revolt all over the world. Awareness of this multiplies our strength tenfold. We shall not surrender Petrograd. We shall defend Petrograd.